Kappa time, from 6 a.m. to 10 a.m. is the time to exercise to overcome the heaviness of sleep, to re-set the metabolism, and to get the brain going. Pitta time, from 10 a.m. to 2 p.m. is when digestion is at its best and the major meal is to be eaten. 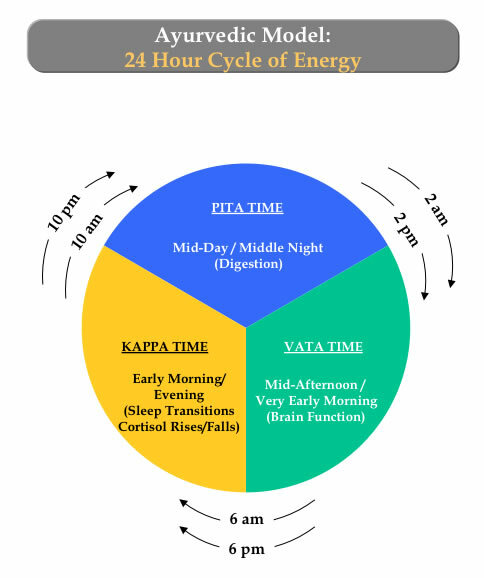 Vata time, from 2 p.m. to 6 p.m. is the time, after a nourishing noontime meal, for effective and sustained brain function. Kappa time, from 6 p.m. to 10 p.m. in the evening is again “heavy” time that naturally sets up sleep. Cultures in the past retired about two hours after sunset…they had enough energy in the early evening to allow the body to relax and fall asleep with ease, and they could capture the most efficient hours for sleep, from 8 p.m. to 6 a.m. This sets us up for a natural fast from eating, from 10 p.m. to 6 a.m., which helps re-set the metabolism and helps the liver detoxify the body as it prepares for the next day.